With our distinctive Diamond Employee of the Month Recognition Award, you can reward top achievers and motivate your entire workforce in one easy step. 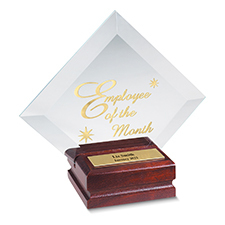 This employee of the month award features a diamond-shaped glass with gold imprinting mounted on a cherry-wood-base. Engrave up to 2 lines, 25 characters max/line.